Hanging a floor system off balloon-framed walls isn't too different from platform framing. 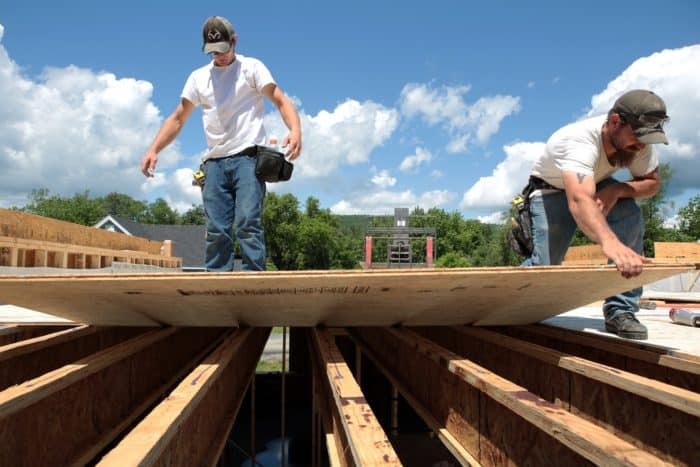 The floor system is comprised of Weyerhaeuser’s TJI joists, Microllam LVLs for ledgers, Timberstrand LSL Rim Board, and Huber’s Advantech flooring. 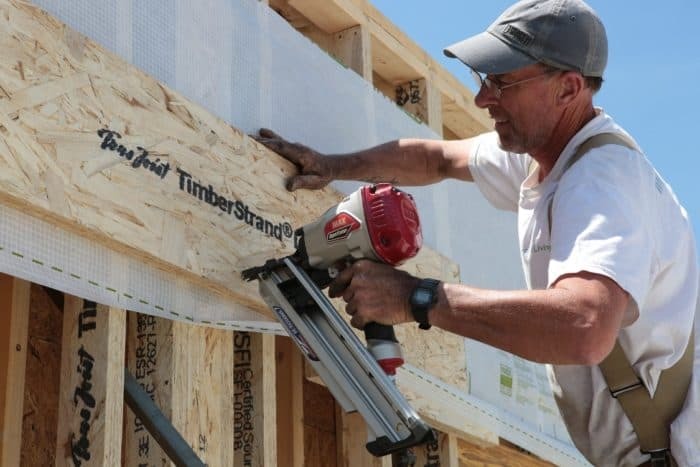 Microllams are used where joist hangers are needed to support the TJIs and the LSL rim board is used along the parallel walls. It’s nothing out of the ordinary, except that the floor system is hung from the exterior walls instead of sitting on top of them. Since I haven’t met a person yet that wants their floor system to collapse, a structural engineer reviewed the plans and signed off on our approach for peace of mind. The Microllams are fastened to each LSL stud with 3 Simpson Strong-Tie 5-in. SDWS Timber Screws. The inner stud wall that the floor system attaches to sits on the concrete slab, which in turn is poured over Amvic SilveRboard insulation. With a compressive strength of 35 psi, the foam is more than adequate to handle the additional 5 psi from the weight of the floor system. Strong-Drive SDWS screws fasten the LVL ledger to the wall. Joist hangers attached to the LVL carry the floor joists. Rim joist stock is used on the walls parallel to the joists. In addition, 8-in. x 5-in. gussets connect the inner studs to the outer studs in the exterior wall assembly to transfer load to the outside studs, should any movement of the inside wall occur. We used Advantech subfloor adhesive to glue the Advantech flooring to the TJIs. 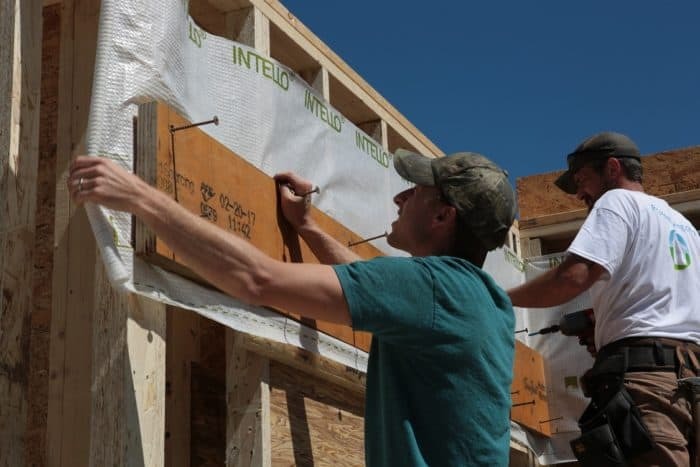 It’s a polyurethane foam that is quick and easy to apply compared to tube adhesives that require a caulking gun and young laborer that needs to build up forearm strength. It does set up quick, so it’s important not to get too far ahead of the crew laying sheets of flooring. As a final step, we screw the flooring to the joists to reduce the possibility of squeaks in the floor system. AdvanTech subfloor adhesive is a gun-applied foam that quickly turns into a polyurethane gel. The black gun is PTFE coated for easier clean up. 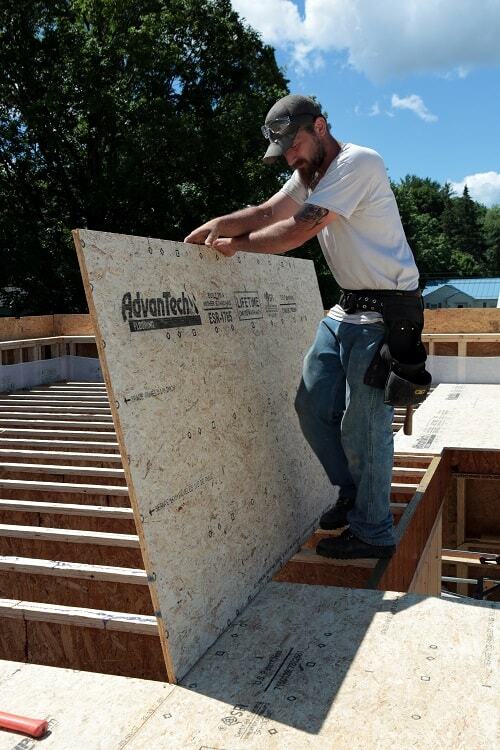 With the adhesive applied to the top of the joists, an AdvanTech flooring panel is moved into place. The adhesive sets up pretty quickly so don’t apply it too far ahead of where you’re working.